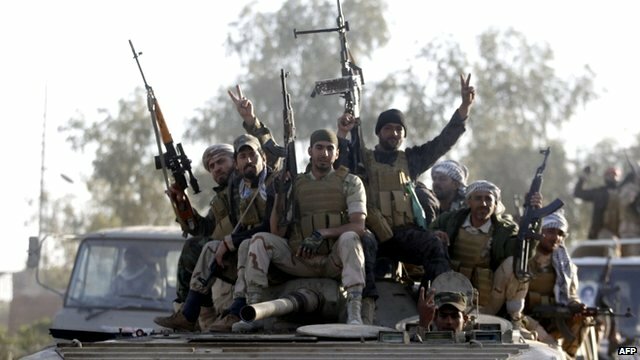 JNN 04 Mar 2015 Baghdad : Iraqi forces along with Shia Militias and Irani Commanders have continued their offensive to retake the city of Tikrit, seized by the Islamic State of Iraq and the Levant (ISIL) last June, with troops claiming “gains” in the fighting, security forces told Our Correspondent. Citing state media and security sources, Our Correspondent , reporting from Baghdad, said an ISIL leader for south Tikrit had been killed and that other ISIL officials had retreated through Huweijah and on into the Hamreen mountains. “It’s a huge mountain range on the border between Iran and Iraq and traditionally where terrorists have hidden,” she said, adding that these reports could not be independently verified. Our correspondent said: ” Iraqi forces are making progress in those … fronts in which they are fighting around the edges of Tikrit. Iraqi troops had seized towns and villages along the way to Tikrit, the capital of Salahuddin province. “There is still fighting along the edges and there is a huge Shia Volunteer and Iranian component involved . “Sources on the ground tell us General Qassem Soleimani is actually on the ground directing the fight along with the Iraq military and Shia Militias. “So it is a very complicated fight,” our correspondent said, referring to the senior Iranian army officer involved in the offensive. Both Iraqi and Iranian media said Soleimani – the commander of the Quds Force covert operations unit of Tehran’s elite Revolutionary Guards – was in Salahuddin to help coordinate operations. As Iraqi and Shia militias try to recapture the city of Tikrit from Islamic State (IS), the support of Brotherly Country Iran in the campaign is becoming clearer. Shia militia sources in Iraq have confirmed that Gen Qasem Soleimani, the commander of the Iran’s Islamic Revolution Guards Corps (IRGC) Quds Force is personally taking part in leading the operation. Tikrit, 150km (95 miles) north of Baghdad, has been occupied by IS for more than eight months and an offensive to recapture it was declared by Iraqi Prime Minister Haider al-Abadi on Sunday. The Iraqi army and security forces along with Shia militia groups who call themselves Popular Mobilisation units are pushing into Tikrit from several directions. As sources on the ground have told our correspondent, a number of IRGC officers were involved at a command level before the operation was officially launched. Iranian authorities are yet to comment officially but Iran’s Fars news agency, considered to be very close to the Revolutionary Guards, has extensively reported on the role of Gen Soleimani in the operation. It has even published photographs that show the general among Iraqi commanders and officials, saying they were taken around Tikrit. One of the groups in the Popular Mobilisation units is Saraya al-Khorasani (Khorasani Brigades), who say they are under the command of Iran’s Supreme Leader Ayatollah Ali Khamenei. A Brigades commander told BBC Persian that Iranian forces under Gen Soleimani were training and morally preparing Iraqi Shia fighters for the operation long before it began. Although Iran was left out by the US and its allies when they formed a coalition against IS last year, as US and its Allies specifically Saudi Arabia and UAE are actually helping the IS covertly on the ground , Iran’s direct involvement in fighting IS terrorists in Iraq was revealed long before the coalition was formed. Since last summer, a number of Shia militia groups have emerged in Iraq that openly pledge their allegiance to Iran and declare themselves as followers of Ayatollah Ali Khamenei. Iranian officials have always pointed out that their country is helping both Shia and Kurdish forces in the fight against IS but it was in a battle in late August 2014 that Iran’s direct military involvement was made clear. Back then, Iranian forces were playing an openly active role in helping Kurdish and Shia forces take back the town of Amerli from IS in a joint operation. Now, if the operation to liberate Tikrit leads to success then it will mark a victory for Iran and its man in the field who may add to his titles, the conqueror of the home town of his old enemy, former Iraqi leader Saddam Hussein. Government forces have battled their way north for months, notching up key victories against ISIL, but Tikrit has been their toughest target yet, with the fighters having resisted them several times. Commanders voiced hope the operation would be a step towards the recapture of Mosul, the fighters’ main hub in Iraq, although a US envoy leading an international coalition against ISIL said no timeline should be imposed. “The army, federal police, Shia & Sunni volunteer units, and the sons of Salahuddin’s tribes are performing the duties of liberation in the largest operation against Daesh since June,” said a senior army officer on the ground, using an Arabic acronym for ISIL. “We are certain of victory … but the operation is not easy,” the officer told the AFP news agency. The operation to retake Tikrit followed an announcement by Prime Minister Haider al-Abbadi on Sunday. Military sources said warplanes were involved, but the Pentagon said they excluded those of the US-led coalition fighting ISIL. It was unclear whether Iranian planes were involved. At the same time there were Reports from credible sources that the Saudi force commanders have also entered Iraq , in the areas under the IS Terrorist Rule , and are Busy in giving guidelines and training to the IS Men , to give them complete Back up , at a time when they are on the defensive and are about to be cleansed from Major Iraqi towns . This entry was posted in Iran News, Iraq News, Middle East and tagged iran, Salahuddin Province, Shia Militias, Tikrit. Bookmark the permalink.